I headed to Seattle on Saturday the 9th to rendezvous with my host, former classmate, and Shadow contact person, Christina Gremore ’14. Christina had not only made the Shadow possible by petitioning her former boss, but also offered up her apartment for two lucky Reedies to stay for the duration of the Shadow. I was doubly lucky as an old classmate of hers, since she invited me to arrive two days early in order to have dinner and catch up with her before her business trip to Austin. Though we would only reunite for those few hours for the duration of the Shadow, I was reminded exactly how lucky I am to know her. I can only hope that one day in the near future, I will be just as accomplished as Christina in my personal and professional life. Christina had arranged for us Reedies to Shadow her old department and thereby develop an understanding of the demands and growth potential at an entry-level job. Andrew Barker, Christina’s former boss and a manager in the Product Consulting department, graciously took the three of us Reedies under his wing for the entirety of our time at Tableau. Coming into the Shadow, I honestly didn’t expect too much from the experience. I already knew that I liked the product and believed in the company’s mission, so I was skeptical that I would learn much more from the experience. Andrew and the rest of the employees at Tableau quickly made me eat my words. Throughout my time at Tableau, I was blown away by the generosity, hospitality, and candor of the employees. It was one thing to have done my research on the company and another to be able to speak to people working there about their own career journeys. 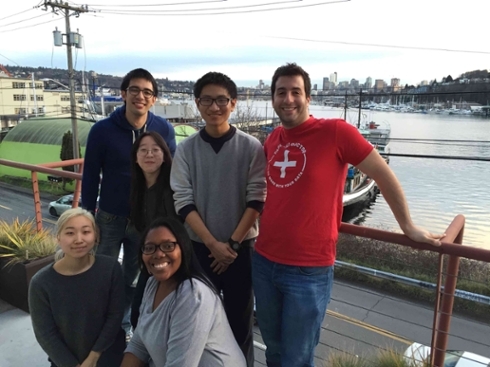 Andrew and the other employees were happy to talk about their time at Tableau and their experiences transitioning into gainful (or more satisfying) employment. For the first day of the Shadow we received a general overview of Tableau as a company. Andrew talked about Tableau’s beginnings, its organizational structure, and gave us a tour of the Seattle campus after providing lunch. I found the tour to be one of the highlights of the Shadow since we got to learn more about how the different departments (and the people within them) work together. Taking the American Capitalism Sociology class has really impressed upon me the importance of organizational structures for employee satisfaction, so I was pleased to hear that Tableau is conscious of the potential perils of transitioning from a national business to a global corporation. On our second day, we met with three Reed alumni working in Development and Product Management. I had been particularly eager to speak with the alumni since they were all working in positions of interest to me. Mary Solbrig and Steven Case gave their two cents on the necessary skills for junior developer hopefuls. Clara Siegel explained her role as a member of the prestigious Product Management team. As with the Shadow as a whole, I initially had my doubts of the utility of the meetings. The three were Math and Physics majors with highly decorated resumes, and I was unsure that I, without an extensive scholastic or technical background, could follow in their footsteps. Once again, my doubts proved foolish, as Mary debated the immediate necessity of a master’s degree, Steven recommended doing a project of interest over doing the “right” project, and Clara demystified the line between marketing and strategy. Clara also made the observation that the working environment at Tableau reminded her of Reed with its open and supportive community. Clara’s opinion that Tableau is a company which supports the growth of its employees is one I heard repeated from new entrants to the labor force and seasoned professionals alike. For the last two days, Andrew had us working through the Gold Certification challenges for new recruits to the Product Consulting team. As is the running theme of my Shadow experience, I again underestimated Tableau, this time the versatility and complexity of the data visualization software. I had started the assignments with the idea that Tableau would be a suped-up version of Excel, but the product turned out to be more along the lines of an Adobe Creative Suite product. Like Photoshop or Illustrator, Tableau allows novice users to immediately elevate their visualizations, but only more experienced users will harness its true potential. I spent more of my time talking to employees and listening to scheduled consulting appointments than studying, so I more or less conceded the prize of a Starbucks gift card to fellow Shadow attendee Ziyuan (who nonetheless definitely earned that card). Once again, I was impressed and gratified by the willingness of the Product Consulting team members to sit down and talk to us about their work. Fellow senior Jeanie jokingly explained our presence to confused employees as “Take Your Child to Work Day,” but despite the veracity of that statement, the PC team members shook off their initial bemusement and were generous with their advice. I am so glad that I made the trip to Seattle to visit Tableau Software. The experience gave me a first-hand look at a supportive, engaging, dynamic, and humane work environment. Learning that the organizational structure of Tableau mirrors its mission and values has propelled the company from one in a sea of possible employers to a benchmark for all other firms as I plan life after Reed.